← Why Share Learning Intentions with Students? The distinction between learning contexts and learning intentions is an important pre-requisite to realizing the improvement in student learning which education research evidence suggests is achievable. A common trap for teachers is to focus on the context for learning (i.e. the activity, project, experiment, novel, etc.) and overlook the learning intention it was meant to serve. Wiliam states “this is why good teaching is so extraordinarily difficult. It is relatively easy to think up cool stuff for students to do in classrooms, but the problem with such an activity-based approach is that too often, it is not clear what the students are going to learn.” I agree that it is hard to teach well in a classroom that has a curriculum that is built upon activities but do not agree with his claim that good teaching is difficult. Most teachers are able to quickly comprehend the distinction between learning intentions and learning contexts (though the language may be new to some). The truly difficult part for us is letting go of the activities that we either feel compelled to “teach” or upon which we have built our units of instruction. The challenge is not teaching but rather designing learning environments that are built upon learning intentions and not upon activities. The hard work is to first identify and clarify the key learning intentions for our respective courses. Having done that, we then can use key learning intentions as a lens to critically evaluate the efficacy of the activities in supporting the learning of students. Note: I am not criticizing any particular activity but rather emphasizing the importance of teacher clarity around the purpose of the activity. I believe that the “good teaching” that Wiliam’s writes about is achievable. In one-on-one conversations I have had with many teachers representing a range of experience, subject areas, and districts, all have had the “aha moment” early in the conversation. Learning objectives can often be muddy or unspecified (mea culpa) but once clarified one has a lens to examine a learning activity and better distinguish between what students were expected to be learning and how they were going about doing the learning. Wiliam provides examples in the table below. Note: It is helpful to characterize high quality learning intentions as ones that are transferable from one learning context to another. By focusing on learning intentions that are “global” in nature we are able to highlight the elements of a course, even a content-heavy one, which are core to the subject (example). We are also better able to assess students for deep learning by observing “their ability to apply their newly acquired knowledge to a similar but different context” (Wiliam, 2011). And lastly, we can see how we might, in a manageable way, “differentiate instruction without creating a classroom in which different students are working towards different goals” (Wiliam 2011). This opens a world of possibility for teacher and student creativity in applying, demonstrating, and building upon new learning. Wiliam, D. (2011). 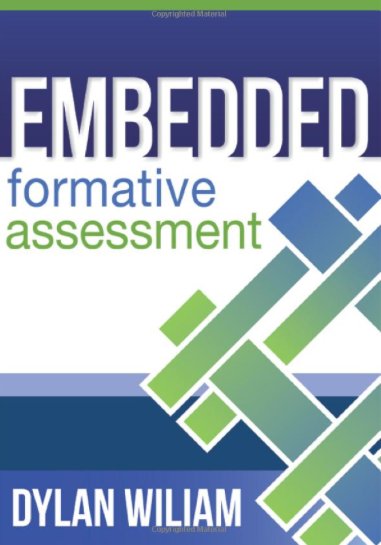 Embedded formative assessment. Bloomington: Solution Tree. This entry was posted in Uncategorized and tagged assessment, learning intentions, planning. Bookmark the permalink. 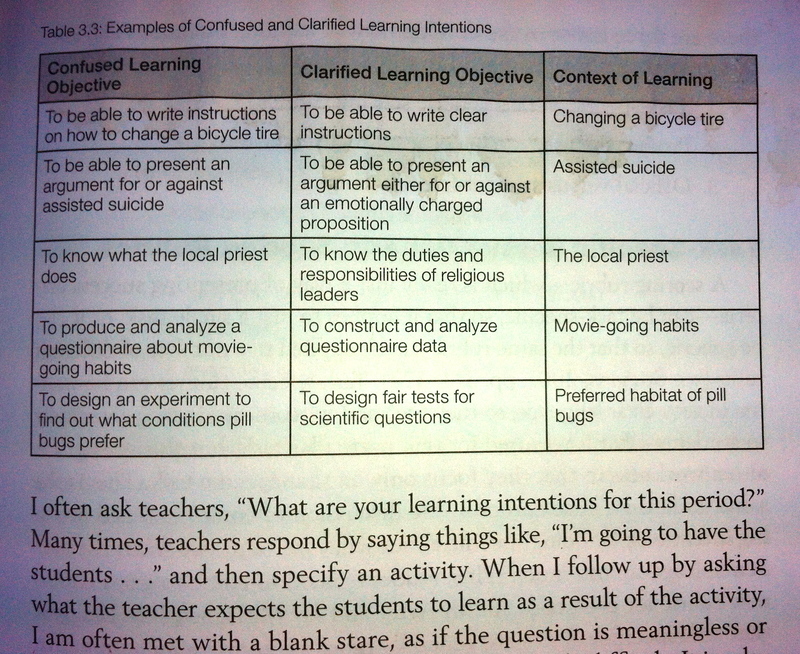 This is an important distinction between activities as learning intentions. I would like to pose a question on who decides what the learning intention will be. Does each individual teacher choose from their own convictions or is there a collaborative learning inquiry which puts into question what are the central purposes of education. I would recommend googling a new book by Jack Martin at SFU titled “Educating Selves”. This book documents the way educational psychology in the last 50 years has transformed the learning intentions in public schooling to develop what he calls the triple *E* student. Self-expressive, self-enterprising and self-entitled to become self-expressive and self-enterprising. There is a chapter on self esteem a chapter on self concept and a chapter on self regulation. Each of these learning intentions shares an ethical and moral compass or orientation. The question of learning *intention* I agree is a profound way to orient our teaching. However, we must still engage as a COMMUNITY of learners/teachers in questioning what are *relevant* intentions. Thanks for this blog which opens a space for questioning our models and intentional purposes. Thanks for your thoughtful comments — I have added Martin’s book to my personal reading list. The question of “which” learning intentions is a key one. Learning intentions can be presented as a checklist of items to know & do. Or they can be presented as enduring understandings (or big ideas etc.) But even so the question of “which” big ideas still sits there. Hence my personal interest in curriculum (both what may be in the pipeline for BC and also reworking the current IRPs we have). I have a post in the works (stay tuned) that shares the collaborative work between myself and some HS colleagues around wrestling the existing PLOs into something transferable and meaningful for students. Content as the learning context, and the tools for learning (including critical thinking & communicating) as the learning objectives.